First off, I'd like to offer my condolences to the friends and family of Mr. Jack Layton. You were a class act, sir, and I'm very sorry you'll never get your chance to captain the ship. This weekend was an odd one. I never stopped moving, but I feel like I got absolutely nothing done. I didn't do any laundry or dishes or cleaning up (boo!). I barely slept, and I feel emotionally drained and worn out. 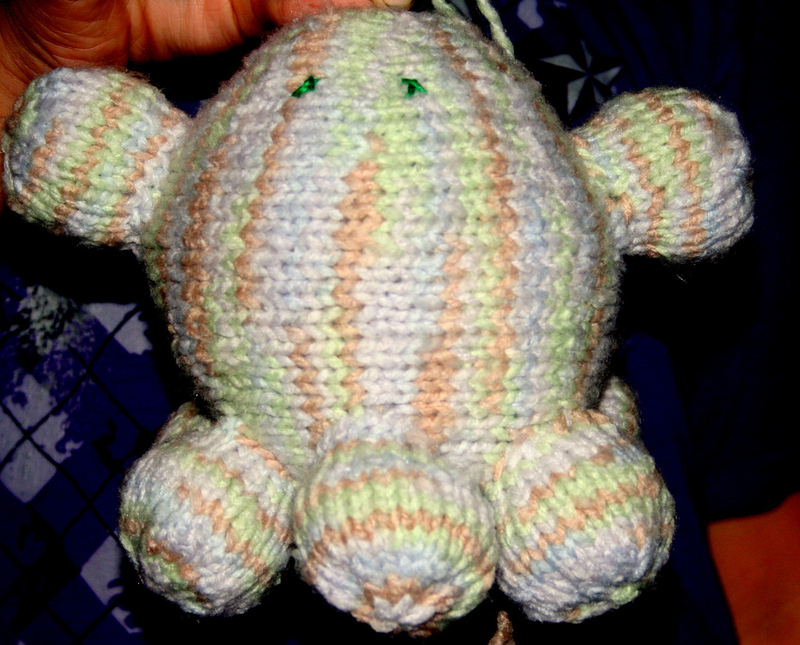 I did manage to finish the stuffed Octopus I was making for a coworker's baby shower (which is tomorrow). 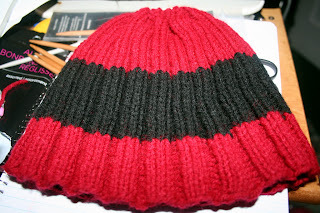 I also managed to start and finish a hat on Saturday for our Charity knit-along :) I started a second hat, but I've only gotten about half-way on that one. I also managed to work a 3 hour shift on Saturday night / Sunday morning, lost most of my faith in humanity on the last call of the night, and hopefully made a few dollars in the process. Yesterday was a major cluster. Jeff asked me to drive out to Barrhaven to pick him and the kids up. Okay, no problem. I had to hit Michaels for the safety eyes and polyfill anyway. I went to the Pinecrest Mall location (sorry Kit!) because it was on the way. They had NOTHING. No 16" circs, not a great selection of PolyFill (they had "heritage cotton filling" which was $20 for an 8oz bag - I don't think so! ), no safety eyes. That, and it took me a full 30 minutes to get OUT of the parking lot once I returned to my car. I don't think I'll be going back to the Pinecrest Mall, like ever. Maybe when the kids go off to college, I'll buy them some Ikea furniture, but other than that? Forget it! Then I headed to Barrhaven (late) and promptly got lost. I couldn't figure out what I'd done wrong until I realized that I came up from Greenbank when normally I'd go up Woodroffe to get there. Jeff got me back onto the right street eventually, and I found it from there. *sigh* Sometimes it's like my brain just shuts down and that's all there is to it. Of course, having worked the 12-3am shift, I slept in, and was therefore unable to fall asleep last night. It was the first time it got cold enough for me to actually pull a blanket out of the closet! :D I love cool temperatures when I'm sleeping - that's the main thing Rob and I disagree on. He likes it warm and cozy. Yuck. ;) Good thing I'm not working tonight, so maybe we'll be able to get some cleaning done - I'd like to get the kitchen table cleared off before the kids start school. The boy has his own desk, but my daughter has to use the livingroom floor right now. We'll see how it goes. So what did I accomplish? Not much, when all is said and done!